Amazon.com Price: $14.55 (as of 2019-04-22 02:24:35 GMT) Product prices and availability are accurate as of the date/time indicated and are subject to change. Any price and availability information displayed on Amazon.com at the time of purchase will apply to the purchase of this product. Your Car, Your Identity — Power up your car with the latest upgrades in pursuit technology and personalize your bodywork with fresh paintjobs, liveries, custom license plates, rims, and decals to show off your car to the world. With millions of potential combinations, you can save different configurations and keep a variety of car packages on alert to leave your mark no matter the situation. NFS Network — NFS Network will be the hub for continuing your racing and chasing with access to stats, leaderboards and content uploads direct from the game. Breakdown what’s happening in your friends’ worlds in real time to see how AllDrive has shaped who owns what in their world. Also in the Network, engage with Need for Speed Rivals from the web, tablet, or mobile in Overwatch, a mini-game that connects you with the console/PC game by letting you help or hinder your friends to earn points towards exclusive paintjobs. Keep a watch on all the other players in your world using a real-time map that locates the cops before you start a race, or quickly find out which hideout is closest for you or your friend to bank Speed Points. Drop police road blocks and helicopters, or alert friends of inbound cops. Cops vs. Racers – Racers are lone wolves out for their own glory; driving agile cars built for high speed racing and epic chases. Cops work in teams to hunt down and bust racers using the full power of the police force. 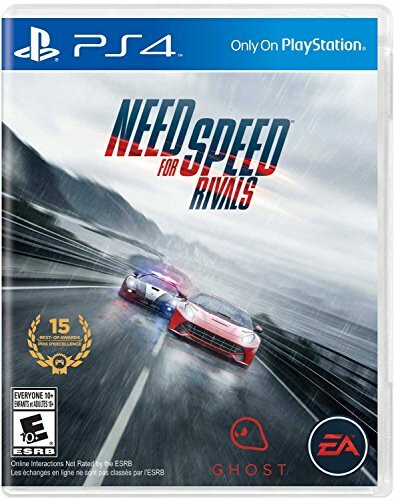 High Stakes Rivalry – Watch the stakes grow through a new scoring system that lets racers risk their speed points to shoot for higher multipliers and greater rewards, or bank their speed points safely when they return to a hideout. AllDrive – This revolutionary new feature lets you seamlessly join a world where your friends are already racing and chasing. Single-player and multiplayer are no longer isolated game modes.